If you think the Nozawa Onsen Fire Festival is crazy, well then mark your diaries for 2016 and head for the Onbashira Festival (御柱) in Suwa, Nagano. Being one of the “Big Three Strange Festivals” in all of Japan, the festival is held every six years and is something that definitely shouldn’t be missed. The purpose of the festival is to symbolically renew the Suwa Taisha or Suwa Grand Shrine. “Onbashira” can be literally translated as “the honored pillars”. Every six years in April and May, huge logs are selected from trees in mountain forests in the Lake Suwa region and transported by hand to the smaller shrines of Suwa Taisha. The Onbashira festival is reputed to have continued, uninterrupted, for 1200 years. The festival is held once every six years, in the years of the Monkey and the Tiger in the Chinese zodiac, however the locals may say “once in seven years,” because of the traditional Japanese custom of including the current year when counting a length of time. Onbashira lasts several months, and consists of two segments, Yamadashi and Satobiki. Yamadashi traditionally takes place in April, and Satobiki takes place in May. 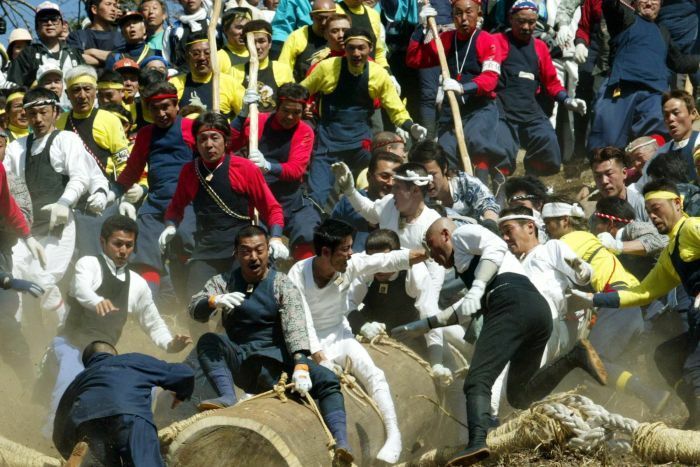 Part of the journey includes Kiotoshi, where local men climb aboard the logs and endeavour to stay on as they slide down the steep mountainside. Injuries and deaths have occurred during the festival in past years, though being killed by one of the trees is considered to be an honourable death. “Satobiki” festival involves the symbolic placement of the new logs to support the foundation of the shrine buildings. The logs are raised by hand, with a ceremonial group of log bearers who ride the log as it is being raised and sing from the top of the log to announce the successful raising. After two festivals, there is an important event “Building of Hoden”. This event isn’t generally famous, and few people know that the event is held even among people who live nearby and participate in Yamadashi and Satobiki. The end of this event marks the end of Onbashira. This entry was posted in Festivals and tagged Nagano, Onbashira Festival, Suwa.